Here at Ben's, we love bicycles. But we have a confession to make: We also love motorcycles. If you see a line of street bikes parked out front on a summer's evening, it means all the mechanics are working late. We've spent countless weekends competing in and enjoying bicycle races, and also motorcycle races. Because of this unique pair of passions, we are incredibly excited about the new electric assist E Bikes from Trek that we have to offer, opening the door for new riders and forms of riding. Exactly like a bicycle, except imagine having legs that are twice as strong. 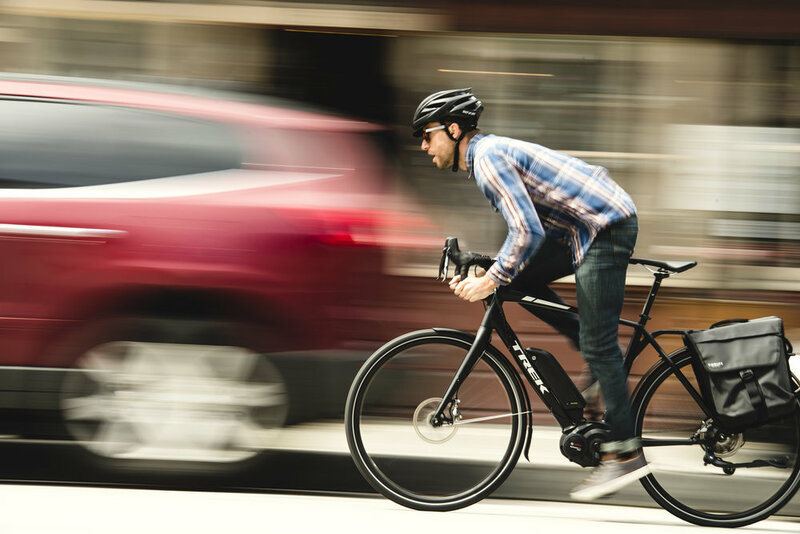 The electric assist does just that: When you pedal, the electric motor kicks in. Pedal harder, and the electric motor puts out more power. The system senses how hard the rider is pedaling, and puts out a proportionate amount of power, with different modes to vary the amount of assistance. Stop pedaling and the electric motor shuts off, making it as easy as, well, riding a bike. Come in for a test ride today! Honestly, anyone. Looking to try cycling for the first time, but worried your fitness level isn't the best, or you can't keep up with your riding partners? An E bike bridges the gap. Wish you could commute to work by bike, but it's just a bit too far? Get there faster (and dryer) with an E Bike. Want a way to check your crops without hauling a quad around, while getting a bit of exercise? Try an E bike. Simple: World class experience combined with small town service and values. We've been riding bikes with, and without motors, our entire lives. Let us help you find the perfect ride for anything you want to do.